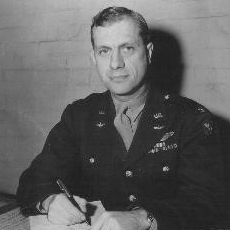 He was air commander and leader of more than 2,000 heavy bombers in a strike against German airfields on 24 December 1944. En route to the target, the failure of 1 engine forced him to relinquish his place at the head of the formation. 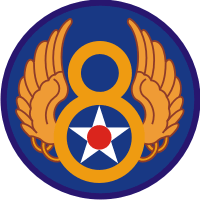 In order not to endanger friendly troops on the ground below, he refused to jettison his bombs to gain speed maneuverability. His lagging, unescorted aircraft became the target of numerous enemy fighters which ripped the left wing with cannon shells. set the oxygen system afire, and wounded 2 members of the crew. Repeated attacks started fires in 2 engines, leaving the Flying Fortress in imminent danger of exploding. Realizing the hopelessness of the situation, the bail-out order was given. Without regard for his personal safety he gallantly remained alone at the controls to afford all other crewmembers an opportunity to escape. 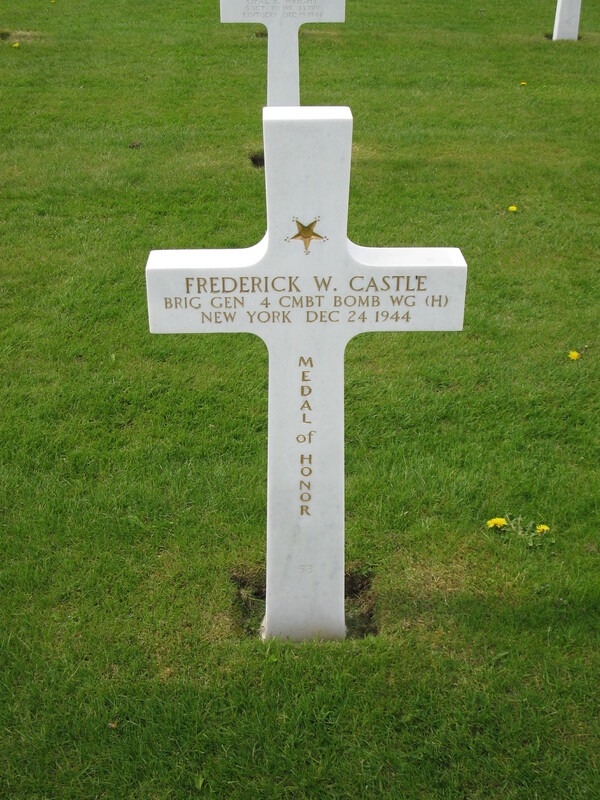 Still another attack exploded gasoline tanks in the right wing, and the bomber plunged earthward, carrying Gen. Castle to his death. His intrepidity and willing sacrifice of his life to save members of the crew were in keeping with the highest traditions of the military service.